Last year’s Reach for the Stars Gala, benefiting Palos Verdes Performing Arts, was a big success. Thanks to generous participants just like you, the event raised over $100,000, vital funds to support the operations, as we plan and present a vibrant array of high-caliber performing arts. This year, we’re reaching even higher, and we invite you to help us celebrate our past, present, and future, by sponsoring a table for this spectacular evening, which is our major fundraiser. We have a limited amount of tables for this high-class nostalgic fundraiser; attendees will enjoy cocktails, a sumptuous meal, and incredible music from The Midtown Men, four members of the original Broadway cast of “The Jersey Boys,” backed by a nine-piece band that will have you rocking to the greatest hits of the sixties! With Tony-winning star-power onstage, and your stellar support offstage, the evening is sure to be one to remember. Throughout the evening, we’ll also be paying homage to the incredible support that helped build this organization, recognizing you for being the present wind beneath our wings, and looking forward to the vast potential of our future. Select area Sponsor of -The Midtown Men (the original Jersey Boys from Broadway), Reach for the Stars Bar, Reach for the Stars Decor, or The Star's Cocktail Reception. GENERAL ADMISSION TICKETS are $525.00 each. 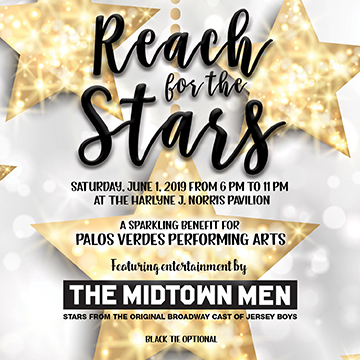 Proceeds from Reach for the Stars will benefit Palos Verdes Performing Arts’ cultural, educational, entertainment, and outreach programs. As a 501c3 non-profit organization, PVPA relies on the generosity of individual and corporate donors to continue the success of our programs. This special benefit is your chance to help us maintain excellence and continue to develop and present outstanding music, theatre, dance, and more to our community. We’re eagerly anticipating this unique evening, and we’d love to have you leading the way as a table sponsor. It’s a great opportunity to merge fun and philanthropy in the beautiful Harlyne J Norris Pavilion. PVPA has a “no refund” policy. All ticket sales are final and non-refundable. There are no refunds unless an event is cancelled and not replaced.